Exercise done in water, or aquacise, offers a multitude of benefits and options. Aquatic fitness provides buoyancy, taking away most or all impact on your bones, joints and muscles, while the water adds pressure to your body, which comforts joints and internal organs and reduces stress on your heart. This allows you to work harder for longer, burning more fat than you could burn doing many land exercises. Exercises range from basic aerobics to resistance training to kickboxing or even tai chi. Many individuals may benefit from aquacise, including beginners, pregnant women, elderly people, patients recovering from injury and the fittest of athletes. All exercise sessions begin with a warmup. Stride back and forth from one side of the pool to the other for about five minutes, keeping moves long and stretching your arms and legs through full ranges of motion. Once warmed up, you will want to increase your heart rate with faster movements such as high-kneed jogging or half-jacks that stop at water surface level. Keep palms open to provide additional resistance. End your session with a cool-down, slowing movements to allow your heart rate to return to normal. Take five to 10 minutes to stretch the muscles you used. Water workouts can incorporate almost any other fitness elements. Kickboxing in the water allows you to punch through the water's resistance and kick without worrying about keeping your balance. Jabs can be done for one minute on the right arm, followed by one minute on the left. Punch forward, pull your arm back, returning to a guarded position with both fists protecting your chest. Stand in a semi-squatted position. Vary the jab by crossing it over your body or jabbing to the side. Add uppercuts that stop at water level and hooks that work your shoulder. Kicks can be done to the front, side or back. Start with a knee lift and then straighten your leg out for proper form. 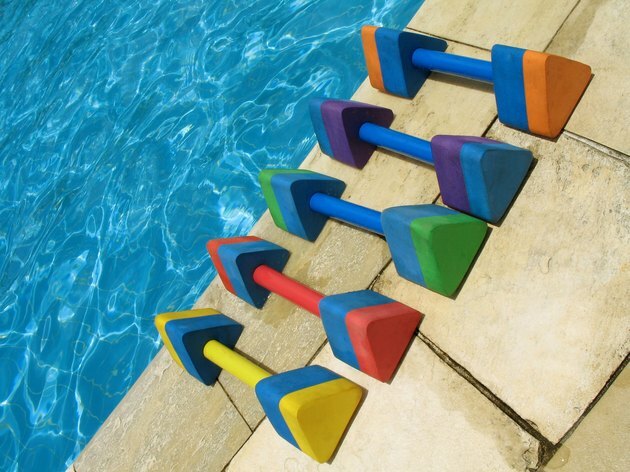 Without any equipment, weight-bearing exercises are an option in the water. For legs, squat and then lift a leg to the side, alternating the leg lift. Or hold the side of the pool and do leg lifts, focusing on the downward push through the water for inner-thigh work. For chest, shoulders and triceps, stand facing the side of the pool with your hands on the rim. Push yourself up and out of the water while straightening your arms. Repeat until failure. Standing side-bends and knee-lifts with a twist to the elbows are good abdominal exercises. One reservation people sometimes have about aquacise is that they believe it is difficult to reach high levels of intensity. In actuality, the water allows you to work as hard you are willing, but it does require extra focus. For interval training, take a movement such as jogging. Jog in place, holding your abs in tight. Focus on raising your knees high while moving open-palmed hands through the water. Continue for two minutes, then do a full-out sprint as fast as you are able for 60 seconds. Return to your jog. This principle can be applied to any movement as long as you work to 100 percent of your ability for part of the session. While the water provides the safest environment possible for exercising, the Arthritis Foundation notes that some health problems, such as certain types of arthritis, may pose issues. Discuss your exercise plans with your physician before beginning any new routine.